This is a funky bluesy R&B record of Dan's all time favourite songs. Don't let the words original and originality fool you. Although there aren't any original tracks on "Goin' Back", the CD is quite full of originality. To say it's a recording of covers would be unjust. You won't be hearing "Mustang Sally", "The Thrill Is Gone" or "Red House" here - I promise you that. 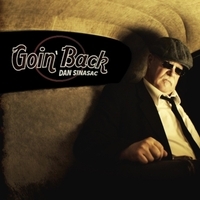 However, what you will be hearing are a collection of songs - from the soul, blues, rock and R&B genres - that influenced and inspired Dan Sinasac through some forty years as a musician. Many of these songs will have you goin' back as well. "Goin' Back" opens with Dan nailing a Temptation's classic called "Can't Get Next To You". Not only is his scratchy voice perfect on the lead vocals, but he's also perfect on all the backup vocals that it took several of them to do. The track features deep rhythm led by Dave Chabot on bass, and an outstanding horn arrangement. Done by performers of every genre, Dan adds his rendition to the list of well done versions of "Ain't Doin' Too Bad". His vocals, both sound and style wise, along with his mastery on the B3 organ, provide him with a formidable 1 - 2 punch. Quite good guitar and tenor sax solos by Jack Semple and Dino Domelli help make this track a winner. More reminiscent of Joe Cocker than Dave Mason, Dan's "Feelin' Alright" and sounding even better on this one. Dan's either got an uncanny knack for picking songs that suit him or he just sounds good on anything he sings. This listener is thinking the latter. More great vocals by Dan, great backup vocals from the ladies, and hot piano and conga work from Chris Andrew and Raul Tabera all make this one smoke. Dan's deep and strong deliverance are an interesting contrast to the soft and relaxed way Bill Withers sang "Ain't No Sunshine". A wonderfully done version of an absolutely wonderful song. The blues is well represented with a version of Elmore James' "Can't Hold Out". With a deep, slow rhythm behind him, this one's pretty much highlighted by Dan - regardless of it being his vocals, his B3 or his harmonica. OK, inasmuch as disco sucked, there were a couple of very good disco songs (yikes, did I say that?). One of those was "Lowdown", by Boz Skaggs". And since I've already stated that Dan Sinasac sounds good singing anything, that includes disco. Need I say the rhythm section excelled on this one? Other tracks that influenced Dan include: "Polk Salad Annie", "Use Me", "Don't Burn Down The Bridge", "Now That The Music Has Gone", "Hi-De-Ho", "Lady Soul", "I Don't Wanna Know" and "You're No Good". You can reach Dan Sinasac by going to www.dansinasac.com - I'm sure he'll be happy to hear from you. I'm also sure he'll be happy to hear the Blewzzman sent you, so please make sure you tell him.